You learn something new every day. And so it was the day I saw a stunning photograph of Tower Wood waterfall in Killarney National Park featured in the Journal.ie. The photo captivated me not just because of its beauty but because I had no idea where the photo had been taken. Having grown up in Killarney and spent plenty of time wandering around the Park, my interest was piqued. The shot was from a photographic book by Norman McCloskey called “Parklight” which documented years of traversing the Park in all sorts of conditions. Having shared the photo on Facebook, I thought no more of the Tower Wood and filed it away in my mind under “Must Find Later”. The waterfall found me again about a year later when it appeared again the facebook page of Peter O’Toole, who is a Conservation Ranger in Killarney National Park. Peter is quite the accomplished photographer himself and keeps hundreds of his friends and followers enthralled as he posts some great shots of his travels around the Park. So I asked Peter where I could find this mystical spot and he duly obliged by pointing me in the direction of the Tower Wood. The waterfall itself is actually known as Cromaglan Cascade, deriving its name from the nearby mountain of the same name. If you’re in luck, there should be room for a couple of cars to park in the little lay by near the tower. I had the place to myself when myself and the dog went for an early morning stroll recently. One thing I was wondering about this place was how child friendly it would be in terms of gaining access. I’m all for family days out with the kids but they’re getting a bit big to be carrying now, so I wanted to be sure that this would be suitable for the kids to walk on their own steam. The good news for those child-carrying parents out there is that you should be able to manage with children but be aware that there is some uneven terrain and a stream crossing to contend with. There is no pathway as such but if you follow the river and listen you will soon find the waterfall. It is a very short walk (just over a kilometer there and back again…) so it’s well worth putting up with a few prickly gorse bushes and the odd muddy patch for the reward you get at the falls. As you walk along the river bank, watch out for some of the local residents. On the day these photos were taken, the dog and I disturbed a heron and an impressive red deer stag within a couple of minutes from leaving the car. I wasn’t able to get a good photo of the deer but it was a treat to hear his hooves pounding the soft forest floor and the crackle of twigs and branches as he made a hasty exit. The screech of the heron gave us more of a fright that the stag! There is one stream crossing to be negotiated which, should prove no difficulty in the summer months. If you are accompanied by small people, you may need to lend a helping hand at this stage. The rocks provide a stepping stone route of sorts but they are a bit wobbly so be careful where you step. My aqua-phobic dog went on strike when he was presented with this crossing and literally turned his back on me and pointed for the car. I emerged, dry and unscathed with Triggs under my oxter, on the opposite bank of the stream with the roar of the falls beginning to rise. All around you is evidence of the hard work undertaken to clear the area of rhododendron. This area was almost impenetrable previously so it’s great to see the place accessible again. Ongoing maintenance is needed to keep the rhododendron at bay so this work needs to be supported. From here it’s a short hop, skip and a jump around some of the ancient oaks before you are greeted by the falls in front of you. Follow the bank to the left and with a bit of scrambling along some deer paths you will soon emerge up on top of the falls. Looking back down on Tower Wood and out over the Park, it truly is a special place. Trace your steps back to the start and as you arrive back at the tower, it’s amazing to think this gem lies hidden beneath the cover of the ancient oaks, just minutes from the busy main road to Killarney. You learn something new every day. I just came across your website today when I googled Tower Wood. 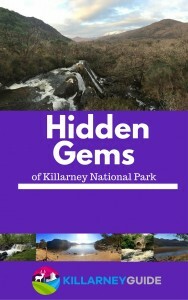 I just wanted to say thank you for providing such a wonderful and insightful reference to Killarney walks and hikes. I have lived in Killarney my whole life and there is always some new place to be explored. I followed your directions to get to Tower Wood today and thanks to you we had a truly great afternoon exploring, I can’t wait to read more of you suggestions! It’s great to hear you’ve found Tower Wood. Like you, I didn’t know about it for years so I’m delighted that you’ve got to experience the place too. Knowing that people are finding these hidden gems is the reason I’m doing this so I will keep at it!! Thank you for this homepage. We will (try to) go to Tower Wood Waterfall in the next days. Thanks for leaving a comment Stefanie. It’s been very dry recently so it should be OK there right now. It’s a beautiful spot, enjoy! Thanks for the comment Roisin, delighted that the directions helped you find this place. I hope you enjoyed it there, it really is special. thanks for posting that about the Tower Road Falls! We found it with your directions. We were the only ones on that Trail. Several hundred people on the torque Falls the same day. Hi Robert, thanks for visiting the site and taking the time to leave a comment. That’s great that you found Tower Wood and the falls. A true hidden gem – and yes, you will rarely meet anyone else when you are there. Glad you enjoyed it!